Photo of the front of building for the restaurant Cluny Bistro & Boulangerie. 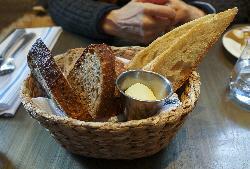 Located in the distillery district in Toronto Ontario. 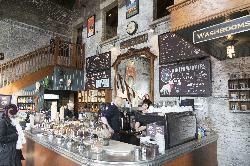 Inside Balzacs Coffee. 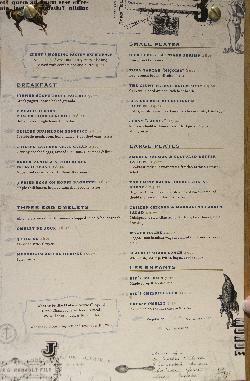 Shows front counter and menu items. Located in the Distillery District in Toronto Ontario. from site: Toronto’s only pedestrian village is the site for Balzac’s second location, opened in 2002. This national historic site with its exquisite Victorian Industrial Architecture is alive with arts and culture, boasting some of Toronto’s finest boutiques and food shops. 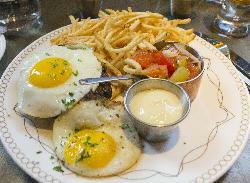 Photo of the Wagyu Hache at Cluny Bistro & Boulangerie. This item was on the brunch menu the 5th of March 2016. 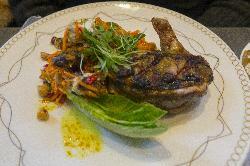 Photo of Grilled Chicken and Marrakesh Carrot Salad at Cluny Bistro & Boulangerie. This item was on the brunch menu the 5th of March 2016. The lunch menu at Cluny Bistro & Boulangerie, taken the 5th of March 2016. 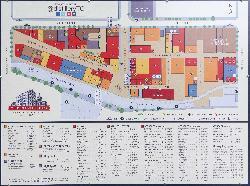 Photo of map on wall in the Toronto Distillery District. Home of many shops and restaurants. If you request full size photo, all businesses will be seen. 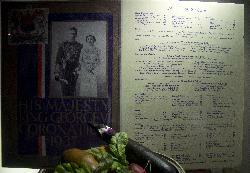 Photo of King George VI and the Royal York May 13th 1937 menu. This photo is of a window display outside the front of the Royal York Hotel in Toronto. from site: George VI (Albert Frederick Arthur George; 14 December 1895 – 6 February 1952) was King of the United Kingdom and the Dominions of the British Commonwealth from 11 December 1936 until his death. He was the last Emperor of India, and the first Head of the Commonwealth. from site: Featured on the obverse are the conjoined effigies of King George VI And Queen Elizabeth, crowned and robed, facing left. The rim is not raised on this medal and there is no legend. Royal York Lobby and Mezzanine taken from Mezzanine Floor. 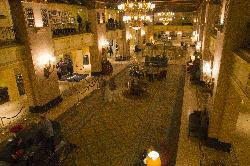 Photo of Fairmont Royal York Lobby and Mezzanine taken from Mezzanine Floor. from site:Introducing Chef Paul Benallick. Born and raised in Guelph, Ontario, Chef Benallick has always followed his passion for food and cuisine. His culinary journey has been rooted in tradition and inspired by modern culinary evolutions. from site: An internationally acclaimed pedestrian-only village, The Distillery features more than 70 ground-floor cultural and retail establishments in the restored red brick, Victorian-era buildings of the renowned Gooderham & Worts whiskey distillery. 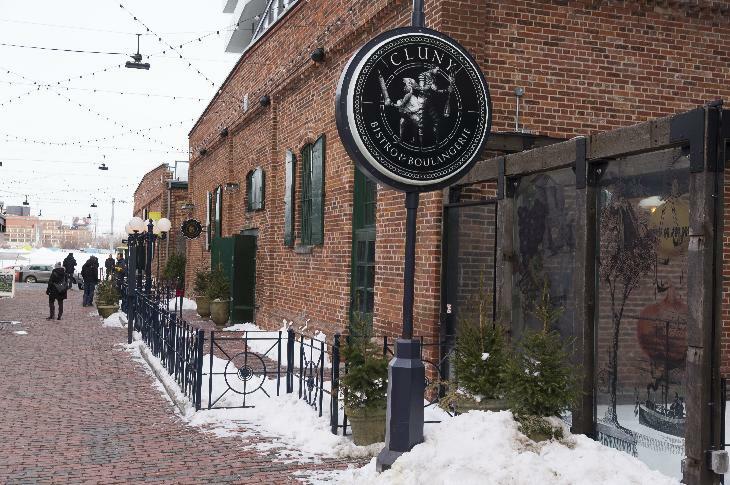 One of Canada's hottest tourist attractions, centrally-located and just a short walk from downtown Toronto there is always something happening at The Distillery.